Where do I go to submit my game? January 31st, 2019 Deadline Extended to February 15th, 2019! Am I allowed to show? 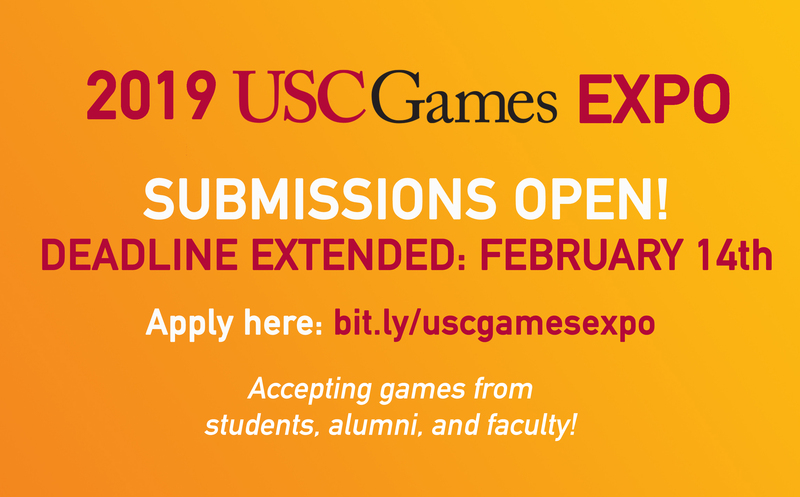 All USC students, across all schools, including IMGD, Viterbi/TAFKA Gamepipe, Annenberg, Marshall, etc. Current students – graduate and undergrad, if you’ve worked on an interactive game/project (digital or physical), it’s allowed! If you worked on a game outside of class on your own, it can be submitted! Strategic partners – if we’ve worked with you or talked with you about partnering up but want to make sure it’s allowed, please send a note to USCInteractive@cinema.usc.edu! Anyone who wants to show off their work to an audience, which will include industry, hiring managers, press, investors, alumni, and a broad swath of the USC family! If it’s a “game,” any type: digital (console, PC, VR, mobile, etc. ), physical (card, yard, board, or other), and everything in between. If you have a cool digital or physical interactive project that isn’t a “game,” that works too, just please submit so we can review! The event will be held on May 8th, and run for most of the day (hard start-end times are coming soon, but expect it to run from around 2pm-9pm or so). It will be the entire ground floor of the USC School of Cinematic Arts, specifically here. I don’t have a game to show, but I want to help; how can I volunteer? Please send any volunteer requests to volunteer to USCInteractive@cinema.usc.edu and we’ll get back to you; please note, if you’re a student, move out day for on-campus housing IS THAT DAY (5/8), so please make arrangements for housing if you’re going to volunteer! Stop it. Just: stop. Games are like any art form: get it in front of people and see what they think – “Perfection is the enemy of the good.” Submit, Show, Succeed! You’re a BOSS, you ROCK, and you’ll be AWESOME! Also: this submission doesn’t mean you have to have a game that’s finished and polished NOW, just that it’ll be ready to show by the deadline date. Teamwork Makes the Dream Work! And now we gotta go! GREAT! We LOVE questions! Just send them to main department email, and we’ll get you answers: USCInteractive@cinema.usc.edu!